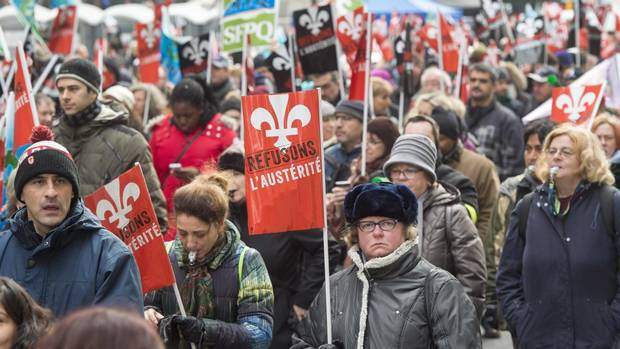 Some 400,000 Quebec public service workers struck for one day on Dec. 9 to show the provincial government of Premier Philippe Couillard that they are indeed angry: their salaries have been frozen and they are getting paid below the going rate for public sector workers. The one-day strike was organized by the Common Front, a coalition between the large National Confederation of Unions (CSN) and a federation of teachers’ unions (FAE) and community groups. Quebec is the largest province in Canada and about 400,000 of its 540,000 public workers are organized. Its current government is trying to drive the budget deficit to zero on the backs of the workers, even though the deficit comes to only about half a percent of its gross domestic product. The minister of government administration, Martin Coiteux, one of the leaders of the government’s negotiating team, told the Montreal newspaper Le Devoir that the strike was “irrelevant,” since the government has no intention of budging. Its offer is a wage increase of 3 percent over five years, with a freeze for the first two years. The unions are looking for an increase of 13.5 percent over three years, or 4.5 percent per year. Some unions struck for more than one day. The FAE held a three-day walkout, starting on Dec. 9. Some of its members camped for a few days outside the Minister of Education’s office in Montreal, with the slogan “Save public schools.” (rabble.ca, Dec. 10) Blue-collar workers in Montreal held a mass meeting on Dec. 8, the day before their walkout. Tens of thousands of workers, angry and needing a raise, walked out all over this vast province, from Purnivituq on Hudson Bay, a town off the province’s road network, to Gaspesie in the east, Sept-Iles on the north shore of the St. Lawrence River, Gatineau in the west, and the large urban centers of Montreal and Quebec City. Workers in Quebec have the second-highest unionization rate in Canada, after the province of Newfoundland and Labrador. They got where they are today by fighting the bosses and showing solidarity. The public service workers have popular opinion on their side and are going to keep on fighting for decent raises.